a. Supports DVD playback and most popular audio and video formats: MP3, 3GP, ACC, MPEG-4, WMV, WMA, AVI, DivX, MOV, Xvid, etc. b. Includes Pseudo-surround effect, 3D sound effect, visualization effects, equalizers and surround sound controlling. c. Supports playing 3D movie . d. Supports video effects to enhance the video quality. 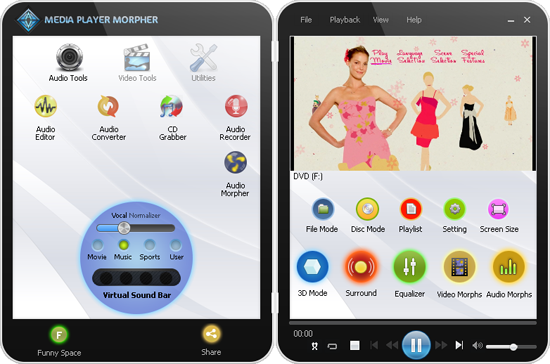 e. Supports Hotkeys and extra keyboard shortcuts to quickly access certain features of Media Player Morpher. f. Allows creating and managing multiple playlists. g. Supports playback control and context menu in full screen viewing. h. Support non-stop playback: fade-out at track end and fade-in at track start. i. Quick-edits audio files with common actions like copy, cut, paste and merges. ii. Advanced-edits audio file with audio effects and save the editings into more than 10 different common file formats. iii. Allows editing multiple files at the same time. iv. Includes a basic player to review the editings. ii. Input separate files one by one; as well as whole folder at once. iii. Offer the possibility of converting files in a batch. iv. Specify encoding settings before conversion. i. Support Advanced Tag Editor - edit Mp3 Tags and other parameters directly and quickly from the program?s main UI. ii. Search for album information in an online database (MusicBrainz.org) and apply that information into Tag fields. iii. Full control over output encoding, including constant and variable modes at selectable bitrates. i. Record from microphone and/or other input devices at the same time. ii. Record conversation from any instant messengers like Skype, Yahoo, MSN, Gtalk, etc. Recent Changes: HD video playing memory optimization. Visualization: displays Lyrics, Artist's biography to your favorite songs while you play your MP3s.